Chances are you begin the day like many working people. You sit down with a cup of coffee and build a to-do list for the day. You do this knowing full well that there are a hundred and one tasks that will come up throughout the day that will take your attention away from your to-do list. Obviously this is an inconvenience but many people don’t consider these distractions as the productivity and efficiency-killing tasks that they are. 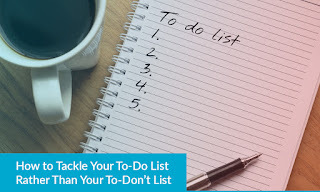 How can you stay on top your to-do list and kick the distractions of the to-don’t list to the curb? Here are some tips! One of the best ways to increase productivity when working from a to-do list is to rank the items on the to-do list. If you just write down a massive list of items and hope to get all of the tasks done before the end of the day then you have not set yourself up for success. Put your most important tasks at the top of the list and work your way down. This way, you will be less tempted to slide additional tasks into the list and ruin your flow. Some people prefer to begin their list with a quick task that they can easily strike off the list. This is a personal choice and depends on your own work style and motivation level. If you like starting the day by striking something off your to-do list early, then create your list accordingly. However, some people may find it more rewarding to put a difficult or urgent task at the top of the list to get that off their mind as early as possible. Experiment with creating your list and ranking tasks to see what works best for your own personal situation. It sounds crazy, right? Putting fewer tasks on your to-do list in order to increase productivity sounds like putting less gas in your car in order to go further. However, creating a realistic to-do list is very important when it comes to actually getting down to work. If you throw everything and the kitchen sink onto your to-do list then it will only seem daunting. Not to mention, there’s no possible way to actually complete your to-do list in one day. The result can be a defeated or helpless feeling. In addition, you may spend more time stressing about how you can possibly get all tasks done than you spend on actually getting things done. Unreasonable to-do lists quickly become vicious, self-defeating circles. What you should focus on is building a to-do list that will help make you feel accomplished at the end of the day. When you come into work the next day you will be riding the high of your success from the previous day. They say success breeds more success and this often rings true for to-do lists. A to-do list can look like a wall of work and uncompleted tasks. Depending on your own personal work style and mindset, looking at a full to-do list can feel stressful, draining, and daunting. It’s also unrealistic to expect yourself to work at peak efficiency throughout the day without a break. Take time to schedule breaks and use available tools to track your breaks and work productivity. One work and break method that a lot of people find very effective is the Pomodoro Technique. Using this technique you work in short bursts rather than long marathons. People typically focus on a task for 25 minutes and then take a 5 minute break. Every 4 work sessions earns a longer break that’s about 15 to 30 minutes in length. Use these short breaks to grab coffee or water and take a short walk away from your workstation. There are browser extensions that can help you track your work and breaks to ensure you stick to your scheduled breaks. There are studies that suggest the 8 hour workday is not the most effective way to work. However, now may not be the right time for a workplace revolution within your office. Instead, recognize that you cannot work forever and schedule an end time on your to-do list. If things are not complete then they will simply have to be pushed to another day. Would you rather do something right when you’re feeling refreshed or just do something because it was on a list? In addition, you should also schedule time to make a schedule. Make time at the beginning or end of each day to build your to-do list. If you don’t schedule some scheduling time then you will just end up doing it outside of your work schedule or you will put off to-do list tasks to get scheduling done. If assessing the technology in your office is on your to-do list then we can help. Contact QBSI-Xerox and get our experts working for you to tackle some of the biggest tasks on your list.